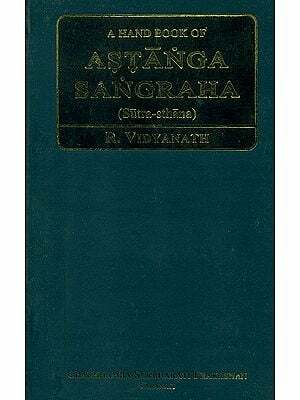 A Hand Book of Astanga Sangraha (sutra sthana) is a précised and concised book in English for the benefit of 1st year B.A.M.S. students. In this book, the authors have incorporated the important quotations and the summary of each and every chapter according to the need of the freshly joined students of Ayurveda. In the present work, Latin names of the drugs, certain photographs as well as line diagrams are also incorporated for a better comprehension, it is hoped that this book will be useful for the students in understanding the basic principles of Ayurveda. Dr. R. Vidyanath currently working as Assistant Professor at Govt. Ayurvedic College, Vijayawada has obtained his M.D. (Ayurveda) from Gujrat Ayurveda University, Jamnagar. He had also undergone special training in Pancakarma from Institute of Ayurveda, Coimbatore. He served as a Clinical Registrar (Gujarat Ayurveda University, Jamnagar), Medical Officer at Government Ayurveda Disperseries and completed 10 years of service in the field of teaching. He has also presented more than 20 scientific papers at National and International Seminars. He was the author of Pancakrama, A Hand book of History of Ayurveda and A Hand book of Astanga Sangraha (sutra sthana). He produced a video-cassette on Pancakarma for student and practitioners and also” an audio-cassette titled ‘Ayurveda Hitopadesam (Tenets of Life) to bring in awareness and popularize Ayurveda in the society. The reign of Gupta Kings may be called the golden period of Indian history. The University of Nalanda was established during the reign of Kumara Gupta I (414-445 A.D.), which also dealt Ayurveda as one of the subjects along with their oriental sciences of India. In this period, the old treatises of different disciplines, including Ayurveda were redacted. During the ancient times acaryas of Ayurveda had written voluminous works on different specialists, which were not tangible to mediocre students. So, the time demanded concise texts or handbook, which covers the essentials of all the eight branches of Ayurveda. Acarya Vagbhata fulfilled this need. At first, he composed a treatise titled ‘Astanga Sangraha’ by collecting materials from Caraka Samhita, Susruta Samhita and other avialble texts. Afterwards various authors composed a number of works in different periods. During 5th to 15th century, many a number of commentaries on Brhattrayi and Laghutrayi were written. The commentators also expressed their own concepts while writing their treatise. In the same period, Nighantus also were composed. Acarya Vagbhata found the tradition of compilations, which has put an end to the original writings like those of Caraka, Susruta etc. He stands at the juncture of Samhita period and medieval period. Vagbhata was the son of Simhagupta and the grandson of Vagbhata. He belonged to the region of river Sindhu. His Father and grandfather were great scholars of Ayurveda. He was the disciple of Avalokita, the chief monk of Mahayana Buddhism. He was the author of Astanga Sangraha and Astanga Hrdya also. The author himself says, ‘By churning the great ocean of medical science, a great store of nectar by name Astanga Hrdaya for the benefit of less intelligent persons’. Plenty of references are found pertaining to Hinduism and Buddhism in Astanga Sangraha, which suggest that Vagbhata was born in Hindu Brahmin family and adopted Buddhism in the later life. Basing on the available internal and external evidences the date of Vagbhata can be fixed between 4th & 5th century A.D.
Astanga Sangraha is one of the authentic texts on the science of life, and hence it has been grouped under Brhattrayi along with Caraka Samhita and Susruta Samhita. The name of the treatise itself suggests that it is a compilation of the eight branches of Ayurveda such as: Kaya, Bala, Graha, Urdhvanga, Salya, Damstra, Jara and Vrsa. Out of all eight branches of Ayurveda. Acarya Carka gave top priority to General Medicine, where as Susruta discussed the Surgical aspects in detail in his treatise Susruta Samhita. Keeping this in view, Acarya Vagbhata gave equal importance to all eight branches and composed a treatise known as Astanga Sangraha. Only Sutra of Astanga Sangraha, was prescribed by C.C.I.M. as a textbook for 1st B.A.B.S. students. In the recent days many a number of translations in Hindi and also in regional languages are available in the market. As a teacher of Astanga Sangraha for the past ten years. I have identified the need of a study material in English prepared in a précised and concised manner for the benefit of the students. 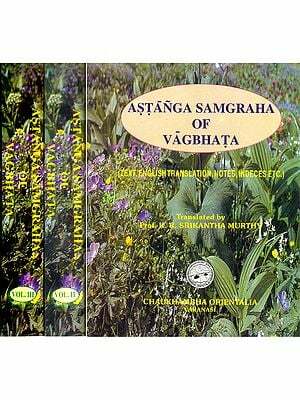 The present book entitled A Handbook of Astanga Sangraha, the name itself suggests that it is an abridged one and the translation of Vagbhata’s work. In this book, I have incorporated only the important quotations and the summary of each and every chapter according to the need of the freshly joined students of Ayurveda. At times, the orders of Sanskrit quotations are also being altered. In the present work, Latin names of the drugs, certain photographs as well as line diagrams are incorporated for a better comprehension. I hope, this book will be useful for the students in undertaking the Basic Principles of Ayurveda. I would like to express my sincere thanks to my parents, teachers, students and friends who helped me directly and indirectly to Shri Janardhana Naidu, I.A.S. Commissioner (Retd. ), Deptt. of Ayush, Govt. of Andhra Pradesh for giving me the opportunity for writing this book. My special thanks are due to my “Teacher” Prof. K. Nishteswar, for this constant encouragement and support and support in continuing the academic activities. I am also thankful to the authorities of M/s Chaukhamba Surbharati Prakashan, Varanasi for their meticulous care in publishing this work.